Our work at Hope Smiles is generational work. Our mission cannot and will not be achieved overnight, nor through the life of just one person. We strive to make quality, compassionate dental care that transforms lives accessible to all people. Providing quality, compassionate dental care means we have to have quality, compassionate people on our team. Mercy Kamwasir is one of those people. 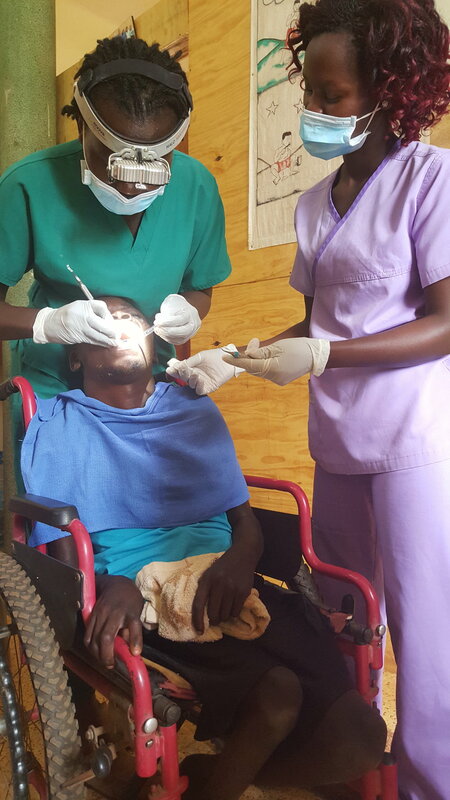 Mercy started working with Hope Smiles as a Public Health Dental Officer (PHDO) in August 2015. PHDOs are â€œmidlevelâ€ dental health professionals authorized to do cleanings, fillings, and extractions in Uganda. A defining characteristic of Mercy is her humble heart ready to improve at what she does everyday. She particularly bought into the why of everything we do — loving people sacrificially as Christ has loved us. Working with Hope Smiles has challenged my intentions and reasons for doing whatever I do into something bigger than just taking away dental pain but doing it for the glory of God; by utilizing the talents that He has given me to build His kingdom. â€œSo many people suffer due to ignorance — it is our responsibility as dental professionals to give them the knowledge that they have the power to stop dental disease for themselves, their children and relatives, and anyone they encounter in their lives. I have also learned to develop a relationship with patients in more than just dental issues but to their personal lives because so many suffer not only because of physical pain but also the pain of feeling unwanted and unloved. It simply takes an assurance for them to know that someone cares about them all because Christ did it for me!!! Mercy’s personal and professional growth has been evident in both the quality of her patient relationships and the quality of her work. The internal drive she has developed over the past year is remarkable. It has been awesome to witness. Her faith, discipline and work over the past year paid off in a big way a few weeks ago — Mercy was accepted into dental school at Makerere University in Kampala! I am a very changed person now as compared to before my time at Hope Smiles. Dr. Ryan always encouraged me to be better today than I was yesterday while remembering tomorrow to be even better than today. I enjoyed the responsibility bestowed unto me for being a leader who works not only by instruction but by example; even through the tough times. I’ve learned that when I start something, I don’t stop until I’ve finished. â€œWith the virtues that Hope Smiles instilled in me and the knowledge I will achieve from school, I want to utilize my talents to serve the people all over Uganda with Hope Smiles. I hope to work with Hope Smiles for my lifetime and raise others to do the same. I also pray that we will be able to extend dental services to my ancestral home in Kapchorwa — which constitutes a population of over 23,000 people — but only served by one dentist who is not always in the hospital. Thus the people end up suffering because of ignorance and lack of dental care. As a team we will miss her strength, humor, and spirit. So will our patients! But we will be alongside her as she progresses through dental school — we are grateful to have opportunity to give her the tools to achieve her vision for her people! We look forward to her rejoining our team (and leading her own) in the future.